This New Year’s Eve, Newport Beach Hotspot Ten Asian is throwing an epic party. Bring your cohort and ready yourselves for the reign of the New Year by walking over Ten’s arched bridge and into a vivacious event. This impressive space boasts high ceilings and minimalist décor, giving you plenty of space to move – so come prepared. Orange County partygoers will revel in the five hour premium open bar Ten Asian is dishing out before raising a glass and counting down to midnight amidst crimson columns. Red flourishes embellish this spacious venue that will light up with a live DJ slaying a Top 40’s mix. Thinking about all of the good things this year will bring you? Start it off right by picking up a pick up a VIP package for perks like reserved seating and bottle service. 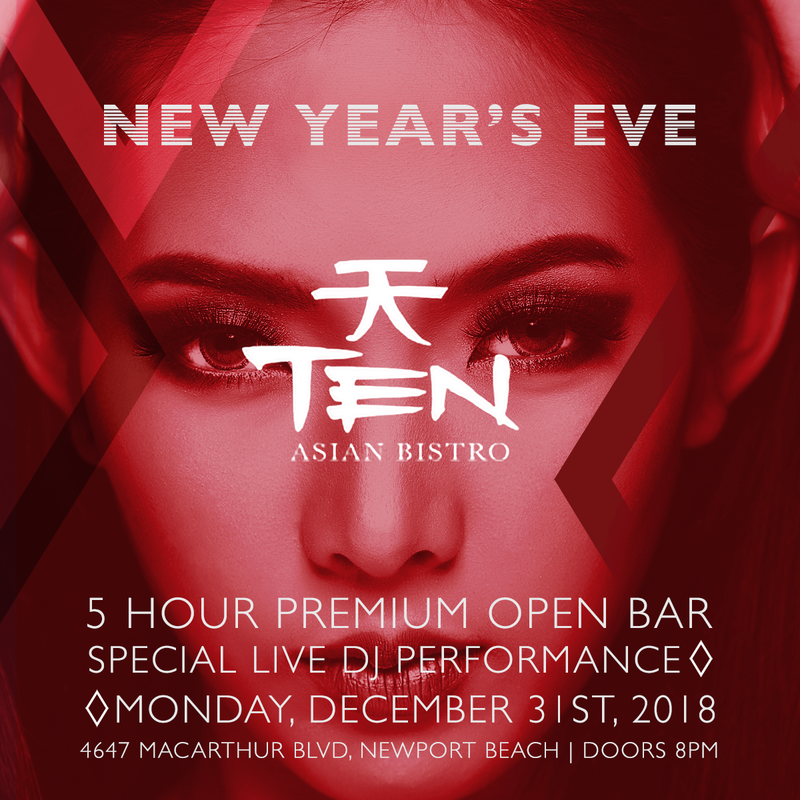 This NYE bash is Newport Beach’s effervescent sendoff into 365 more days of opportunity and you’ll be able to feel it in the energy at Ten Asian. Mingle under a Siddhartha Buddha statue peering over the entire space or move onto the patio to chat next to the fire pit. Transformation is in flux this New Year’s Eve, and as this year melts into the next, celebrate in the realm of Asian fusion. Give your best year yet a running start at Ten Asian this New Year’s Eve.